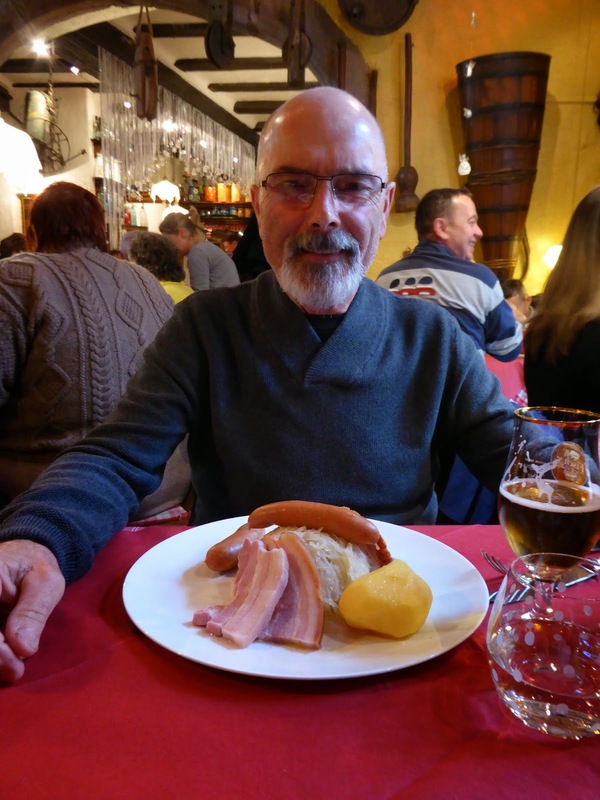 The Travelin' Lundburys: SATURDAY IN ALSACE- David & Di are "Village People"! SATURDAY IN ALSACE- David & Di are "Village People"! It was an early day for the Lundburys--we were up at 5 am, and left our apartment at 8 am. We walked to our tram stop and rode to the train station, where we bought two tickets to Colmar. We had just enough time to make the 8:51 train, and soon were on our way back to beautiful Colmar. We came into the station and easily the "Navettes de Noel" -- or the Christmas Shuttle Bus. 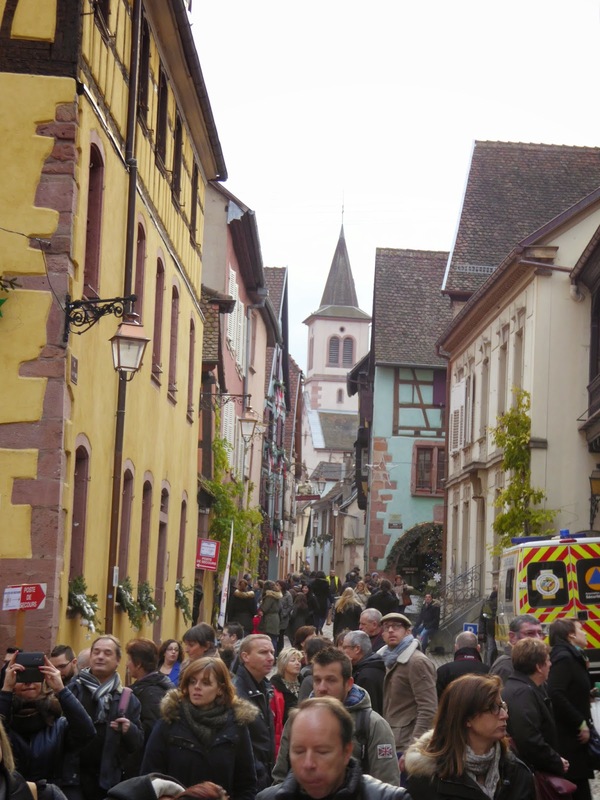 This system of buses travels to smaller villages around Colmar to visit their Christmas Markets. There are a couple of different routes, and we chose route 1, as it left first. We bought a ticket from the driver--a whole 5 Euros each for the entire day of transportation. What a great idea--and a bargain. Our bus rolled along through beautiful wine country and even though there's no foliage on the vines, it's still very pretty. In some areas we noticed the vineyards were terraced on the sides of hills. Soon we arrived in our first village--Kaysersberg. It's a very pretty little village, and we enjoyed wandering the narrow, winding streets. The nice man offered to take our picture--so here we are! The first market area was selling locally made food and wine. There was some mighty tempting cheese and sausage on display, but we resisted. We did share a small snack--a "pancake" like item made from grated vegetables, fried on a griddle and topped with goat cheese. It was yummy! The next market we came to was in the church courtyard. There were about 12 vendors selling local hand made items. This was a nice market and we enjoyed looking at the lovely gifts. I had a nice conversation with a local glass bead artist--her work was amazing. At the very back of the market we went up some steps to a garden area, and found this pretty memorial dedicated to local soldiers lost in WWII. Each cross was marked with their name and each said "died for France". After a couple of hours in town, we made our way back to the pick-up point. We didn't have to wait too long for the next bus, and soon we were on our way to the next village, Ribeauville. As we neared the village, we started noticing cars parked along the small dirt roads by the vineyards. Soon we noticed tour buses--dozens and dozens of them parked along the road and in the vineyards. That should have been our first clue! Ribeauville was MOBBED! It was a heaving sea of humanity--so many people it was hard to walk. We just shuffled along with the crowd. It was almost impossible to see anything in the booths. 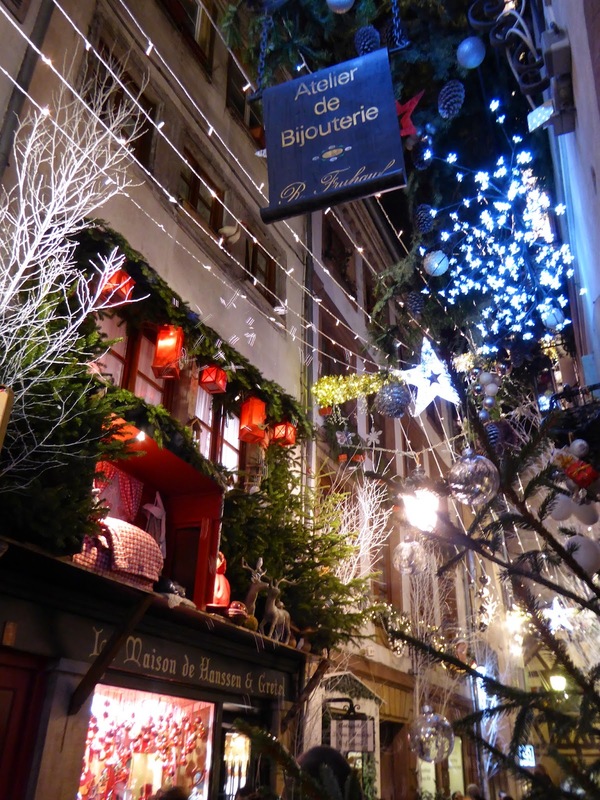 It was also difficult to see the pretty storefronts, but we tried! After awhile, we decided it was time for lunch, as we were getting nowhere fast shuffling along with the crowd. We walked down a small alleyway away from the main street. There were slightly fewer people--whew! 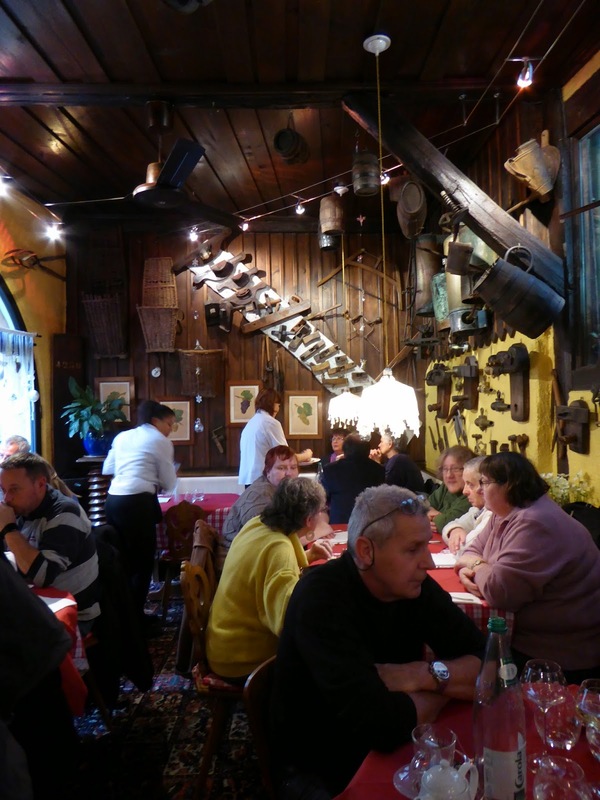 We found a cute little restaurant, and were lucky to be seated fairly quickly. It was packed, but the waitresses were friendly and efficient. We had a nice table near the window, and we just relaxed and watched to people shuffle on past! We ordered our usual choucroute plate, and enjoyed almost every bite. David ordered a beer, and I ordered a locally produced Gewürztraminer. Usually I don't like Gewürztraminers, as they are too sweet for me. This was was somewhat sweet up front, but also had lots of other notes, and I really enjoyed it. I might have to try white wines more often--I'm usually a "red-wine only" gal. We lingered over lunch, almost dreading going back out the the main street and the crowds. But we did--and found that it had thinned out just a little. We walked up the main street for a ways, again exploring little passageways and courtyards. We didn't do any shopping--just enjoyed the lovely village and tried to ignore the hordes of people! Look at all this sausage! Ribeauville is a beautiful and interesting little village. I could almost imagine being there in the 1400's, with all the narrow alleyways, cobblestones and ancient buildings. We both agreed it would be wonderful to visit during the spring or fall, renting a car and driving around the area and visiting all the interesting villages. Hmmmmm--might be an idea for a future trip! We made our way back to the bus stop, and again didn't have to wait too long for the next bus. 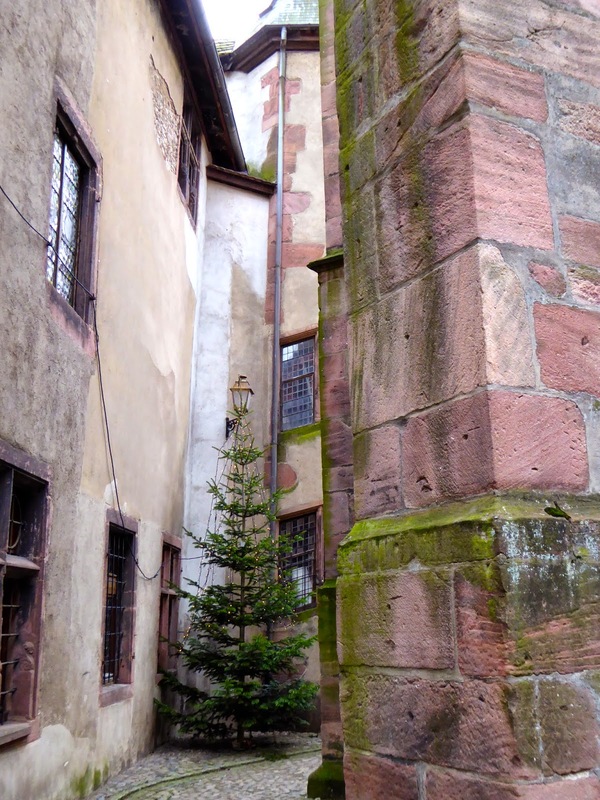 It was a short drive to our next village, Riquewihr. 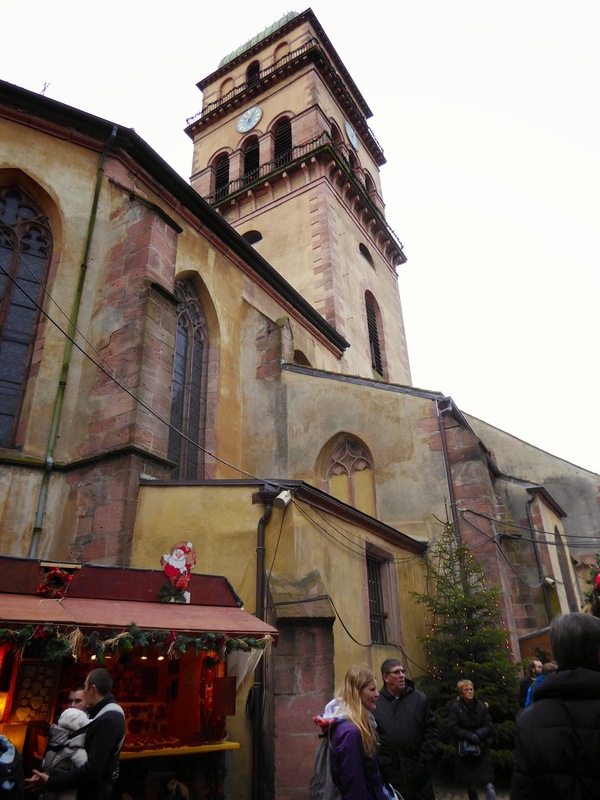 Riquewihr's Christmas Market had a medieval theme, with vendors dressed in appropriate costume, events and performances scheduled, and only hand-made items for sale. We were really looking forward to this market! As we approached the village, we could again see hundreds of cars and dozens and dozens of big tour buses parked along the roads and in the vineyards. 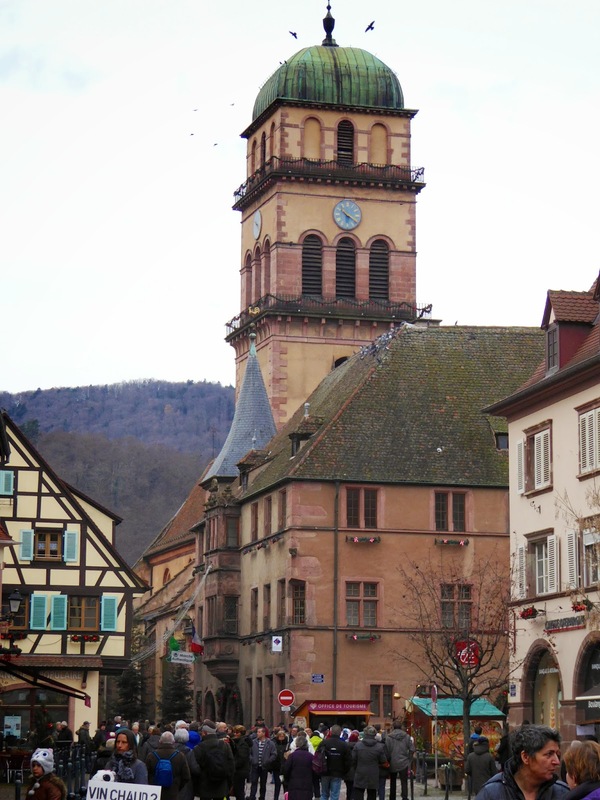 The streets were just as crowded as Ribeauville, so after a quick discussion, we both agreed that we'd just stay on the bus and head back to Colmar! We'd both had enough of the crowds, and it was 4pm already. So we just wimped out! But it was fine, we'd had a great day and it was nice to see a couple of the smaller, charming villages in the area. I think we'll be back some day--but NOT at Christmas time! Our timing was pretty good when we got into Colmar, we bought our return tickets and didn't have to wait long for our train to Strasbourg. We both snoozed a bit on the way back! Back in Strasbourg, we took to tram to the Cathedral Market area and walked back to our apartment. It was VERY busy everywhere tonight--probably because it was the weekend. On our way home, we walked down this street to see what the big crowd was all about--this window decoration included a bubble machine! It was fun watching the kids try to catch the bubbles. By the time we got home it was after 7 pm, and we had a nice mug of chicken soup and some crackers for dinner. It had been a large day, as my dear friend Donna would say! 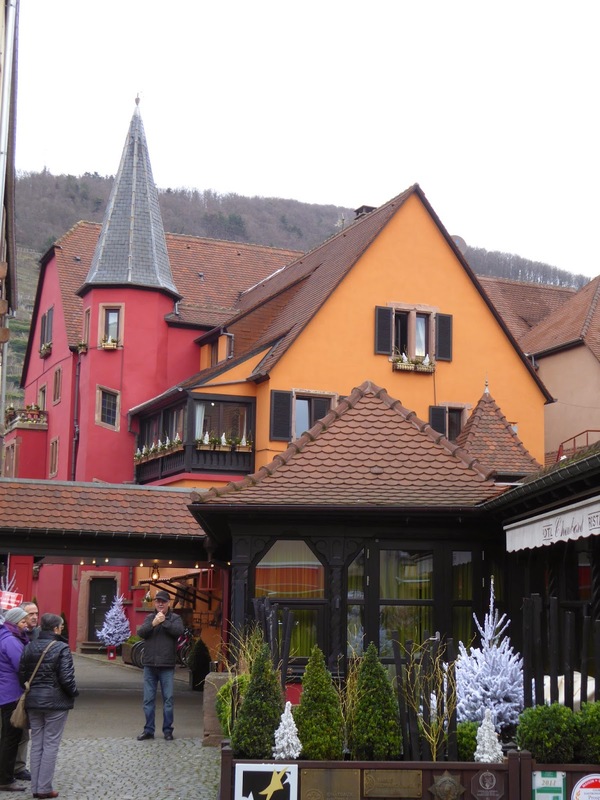 A large and wonderful day in Alsace--what a beautiful area this is.